Collider for the iPhone is Released! After two months of intense development, Collider for the iPhone is finally released! Collider first hit the scene as a Flash game in April, 2009. I started learning iPhone development soon after and released a port of my Flash game Block Drop followed by Furballs!. I’m glad I waited a while to port Collider because I needed everything I learned from the first two projects to even think about creating a game this complicated. The iPhone version features updated graphics including brighter, more colorful background images. I was also able to preserve the dynamically generated music so each level has a different musical composition. Collider for the iPhone also features a much requested new feature, a fast-forward button, as well as an “auto-save” feature that allows you to quit the game at any time and resume playing right where you left off. Collider is an addictive, physics-based iPhone game featuring 56 intricate levels of play and dynamically generated music. Your goal is to destroy all of the positive and negative particle balls. Simply drag the particle balls where you want, press play and watch them come to life! 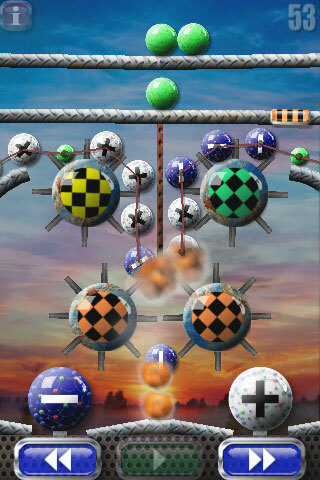 Navigate them through pipes, gears, sensors, bombs, springboards, pendulums, seesaws and more to make them collide.